During an election year, there is always plenty of rhetoric from candidates as they outline their policy goals and reforms. While voters are hearing a lot of this type of jargon, there hasn't been much discussion about a particularly important population: our veterans and service members. The Bush Institute sat down with two of our Military Service Initiative advisers, one of whom is retired and one of whom is still serving as a Reservist, to hear what they think is lacking in this year's political discussion. Colonel Matthew Amidon USMCR and Corporal Jeffrey Cleland, USMC (Retired), outlined some key points they think should be a part of the national conversation as we look toward Election Day. What are you not hearing from the candidates about our veterans and service members that you think we should be hearing or should be amplified? 1) Every year, approximately 200,000 service men and women will transition out of the military on an ongoing basis. That is a significant number of people who will be returning to civilian life and looking for jobs or trying to figure out college. We know that transition looks different for everyone -- but it's fair to ask: Are we giving our transitioning service members the specific tools they need to succeed when they leave the military? 2) Thanks to the post-9/11 GI bill, veterans can have their education costs paid for by the U.S. Department of Veterans Affairs (VA). While bachelor and advanced degrees have tremendous value for some, associates degrees, certificates, or trade training can be a great option for many. Are service members being prepared to access and use the many benefits available to them? 3) The VA has been the subject of many conversations, including the challenges of long wait times. But rather than making the VA an easy target, some data points to the excellent work VA professionals are doing. 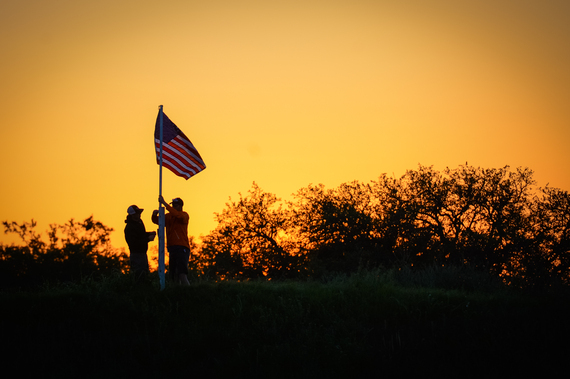 As an example, one recent report shows that while the average number of veteran suicides per day has remained somewhat stable, increases in suicide rates are particularly evident among vets not using Veterans Health Administration services. We should recognize that the VA is an important option in providing quality care for the invisible wounds of war. At the same time we need the private sector to help deliver comprehensive and integrated care that improves the lives of our returning veterans. 4) The Department of Defense (DoD) and the VA can be better aligned in support of transitioning service-members and their families. When Corporal Cleland was transitioning out of the military, his doctor handed him a 4-inch stack of medical charts and said, "Take this with you to the VA, they will need to see your treatment history." That is shocking. It's 2016 and yet our government doesn't have an effective database that allows the two closely-linked agencies to interface with one another. How is that possible? Another common issue that veterans face as a result of misalignment between the two organizations is that drug formularies are often different at each agency. For example, if a service member is prescribed a medication while on active-duty under the DoD's care, the same drug may not be available to them at the VA when they leave service. As a result, they may have to switch medications which can be a daunting and frustrating task. While the 2016 Defense Authorization Act addressed this issue, the results of implementation are still unclear. 5) Candidates for any office should stop characterizing our military as either heroes or victims. Earlier this year, the Bush Institute commissioned a survey of post- 9/11 military veterans as well as adults in the general population in Canada, the United Kingdom, and the United States. The goal was to gain a better understanding of how people think about veterans and their perceptions of issues veterans face, such as the invisible wounds of war - post-traumatic stress (PTS) and traumatic brain injury (TBI). Our research found that when we portray our troops as either heroes or victims, it can contribute to the perception that seeking help is a sign of weakness. Military members don't want to see themselves as heroes or victims because, in their eyes, they just did their job. Victimizing their service can imply that they didn't succeed at their mission or that they didn't go a good job. Romanticizing their service, such as calling them a hero, may create unrealistic expectations that can be challenging to meet. We also found that many members of our military transition without experiencing the debilitating effects of the invisible wounds of war. Many Americans overestimate the number of warriors who have the invisible wounds. The incidence rate for PTS and TBI in our military is markedly similar to that of our civilian population. The hero/victim characterizations can make it harder for veterans to make the transition from military service to civilian life and harder for them to get a good job. In the end, the country will suffer because these veterans are often natural leaders who can long serve as civic and business assets.